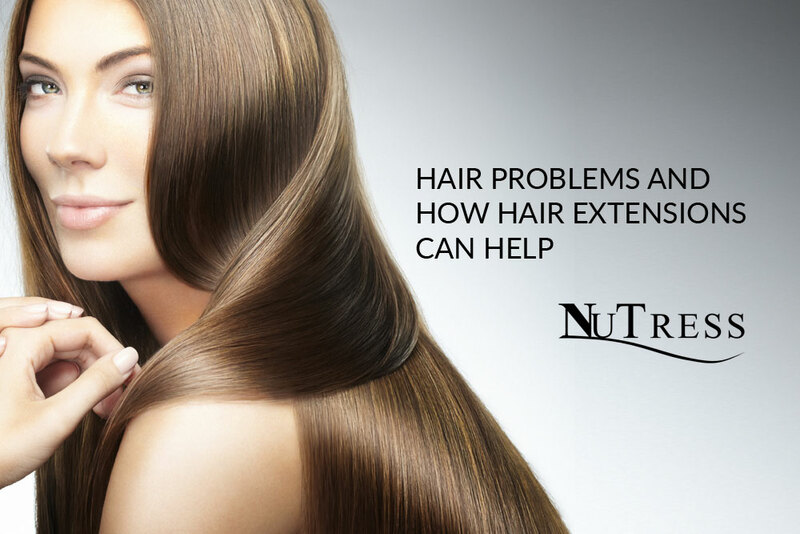 NuTress – tailor-made hair extensions in Manchester. Fed up with your locks? Whatever your hair woes, hair extensions could be the answer to your prayers. There are lots of reasons why our clients come to us for their hair extensions but there’s one thing they all have in common – they’re not happy with their natural hair. We’ve been applying hair extensions in Manchester for 15 years and have fitted them for some bizarre reasons (we’d love to share but that would be a different blog entirely!). So, here are the most common problems that were driving our clients mad before they called us. Do any of them sound familiar? Fed up of fine/thin hair? Very fine/thin hair is challenging. It can look flat and limp, no matter how long you spend styling it, or what products you use. And if you do manage to make it look good, just a gust of wind or a light drizzle can undo all your hard work. It usually looks better worn short, but you might not want or suit short hair! Just a few, tailor-made hair extensions can add volume and weight to your hair, giving it body and volume. This makes it much easier to manage and opens a new world of style possibilities. We apply the most natural hair extensions in Manchester. It’s crucial that those of us with very fine hair have the right type of hair extensions. Only individual, tailor-made hair extensions should be applied to thin/fine hair. Factory-made hair extensions must be avoided. They’re “one size fits all” but they might be too heavy and could put stress on your roots, leading to hair loss. If you’re looking for a specialist salon to fit your hair extensions in Manchester, give us a call! Frustrated with hair that won’t grow? You’ve resisted every haircut that’s caught your eye for ages, so why isn’t your hair getting longer? It’s clearly growing – you need to keep on top of your colour every few weeks! Believe it or not but just because you can see your hair IS growing, it may never get any longer than it is now. You could have a short growth cycle. The average growth cycle is 2-7 years, so if your cycle is at the shorter end, your hair probably won’t grow much past your shoulders. If your hair is lightened, your heated tools are too hot, or your hair’s weak, the ends could be breaking. Or maybe your hairstylist insists on a trim every 6 weeks. I’m not saying you shouldn’t have regular trims but if they’re too frequent, you might be cutting off all the length that’s grown since your last trim! Lots of our clients spent years trying to grow their hair before contacting us. Imagine how delighted they are when after just a few hours in the salon, their hair dreams come true! Hair extensions are great for adding length, without the lengthy (or eternal!) wait. You don’t have to have waist length hair extensions, opt for a couple of inches for a less dramatic change. Whatever you decide, finally the choice is yours. Make sure you choose who fits your hair extensions carefully. There are a lot of bad hair extensions in Manchester (and every other city for that matter!). Both photos show the same client with her natural hair. It took time, but she was able to grow her damaged hair out with the help of our safe hair extensions. Had a run in with bleach and come off worse? You might’ve had your hair lightened for years and never had a problem but one day you notice there seems to be more hair in your brush than usual. Before you know it, your hair is looking thinner, frazzled and over processed. This can be heart breaking, but the good news is, so long as your hair is healthy at the root, there’s no reason why you can’t have hair extensions applied until your natural hair recovers. What’s more, while the hair extensions are in, they can help protect your natural hair, as it’ll look good without so much styling. If you’re looking for hair extensions in Manchester to wear until your natural hair recovers, choose carefully. We only apply safe hair extensions, which allow your natural hair to grow without damage. You have post pregnancy hair loss. Enormous changes happen to our bodies when we’re pregnant, even our hair is affected. While pregnant, you can expect your hair to be the best it’s ever been. In the months following the birth or after you stop breast feeding, it’s normal to lose more hair than usual. Most women only shed the hair that would’ve fell during their pregnancy, the shedding slows to a normal rate and their hair returns to how it was before. 1 in 5 women will lose more though, and their hair will take longer to adjust. Hair extensions are great for getting through this upsetting and often stressful time. Just a few well-placed tailor-made hair extensions might be all you need to get your confidence back, leaving you to spend your time enjoying your new bundle of joy, not worrying about your hair. It is important that your hair extensions aren’t too heavy. NuTress specialise in tailor-made hair extensions in Manchester City Centre. We can adapt our hair extensions to suit each individual. This means we can apply the lightest, most discreet hair extensions available. Your hair’s recovering after an illness. If you’re recovering from an illness, hair loss can be a painful reminder of an upsetting time. And while you’re grateful to be on the mend, if your hair has changed, it can be a constant reminder of a time you’d rather forget. Hair extensions can help you get back to your old self, allowing you to put your illness behind you and look forward to the future. You don’t need to have long hair extensions; a subtle change might be all it takes to get you feeling like yourself again. Quite often, our clients just want their usual style back. It’s important to have hair extensions that can be adapted to fit your specific needs. We’ve built a great reputation for our specialist, tailor-made hair extensions in Manchester, and receive recommendations from health care professionals at several hospitals. You want princess hair for your big day. Ever since you were a little girl you’ve imagined how you’d look on your wedding day. You’ve got the dress, shoes, veil, tiara, etc. but something isn’t quite right – your hair. You may be happy with your natural hair, but when it comes to creating those fairy tale dos’ you’ve imagined for so long, it just isn’t up to the job! And that’s where we come in. You might need just a few, discreet strands to give your hair a little volume boost. Or, you can add lots of length to create a cascade of tumbling waves. Either way, you’ll want your hair extensions to be discreet and look natural. No one wants to spend their big day worrying or have their wedding photos ruined by bad hair extensions! We only apply hand blended, tailor-made hair extensions. This means we can guarantee a perfect colour match and adapt the size of each hair extension to ensure they’re unseen, even in hard to hide areas. We’ve been applying specialist, tailor-made hair extensions in Manchester for 15 years. You’ve planned and organised your wedding with military precision, don’t leave your hair to chance! What next? Call us on 01612582015 to book a free, no obligation consultation. We can answer any questions you have about hair extensions and even apply a couple free of charge. This will give you a chance to go away and get a feel for them before you decide if you’d like to book in. We love to hear from you! Is there another reason you’re looking at hair extensions in Manchester? Please leave your feedback and comments and let us know if you have any other questions. NuTress – specialists in hand blended, tailor-made hair extensions in Manchester.